In the earlier part of this analysis, we saw that folks are finding that, in real-world conditions on long journeys, the 2018 Nissan Leaf battery pack is getting very hot. This is due to the 2018 Leaf not having any active thermal management system. 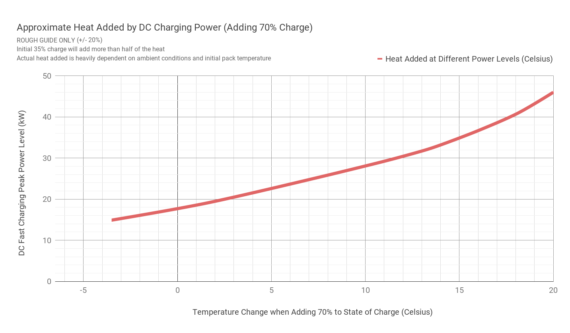 The heat buildup from driving and charging is causing significant charging delays because, when pack temperature gets above 32° Celsius, subsequent charging power is restricted (to prevent overheating), resulting in slower charges. Normal highway-speed driving and charging add a lot of heat, compounding the problem. 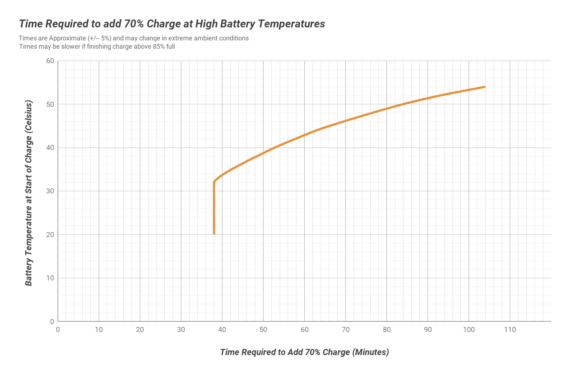 If you don’t follow any strategy, the more charges you have to make, the hotter the battery gets and the slower the charges get. Where’s the chart that describes how much heat is added at various driving speeds? That’s not possible to define because of the complex variables involved, but we will get to this below. To be clear, at steady highway speeds (110–120 km/h, or 68–75 mph) trips of up to 290 km (180 miles) should be reasonably convenient in the 2018 Leaf in most circumstances. These journeys will require minimal adjustment in driver behaviour compared to other mainstream EVs or other cars. The 2018 Leaf is undoubtedly a great car if you never drive further than this. At highway speeds, 290 km (180 miles) is the distance that 2 driving stages, with a fast charge between, will reliably get you (except in extreme conditions). 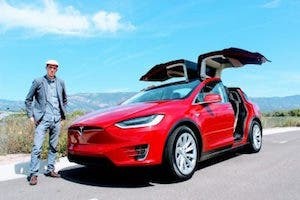 One full powered charge (46 kW) and 290 km (180 miles) of highway-speed driving will build up a lot of heat, but if that’s the end of the journey, that’s not an issue for you — you can just walk away and let the car cool off. But if you need to drive further still, you will need at least one more DC fast charge, and that’s when reduced power charging will arise, causing delays. What can we do about heat? Not much directly. Nissan should implement some advanced charging options to give us more control over the tradeoff between charging speed and added heat we want on a longer journey (more on this at the end). But currently the company doesn’t, so our hands are tied. Indirectly, we can adjust our driving speed and charging strategy to try to keep things under control. 1 — Passive cooling of the battery pack is going on continuously whenever the pack temperature is hotter than the surrounding air. (The basic cooling rate is roughly 6% of the temperature difference per hour). Greater flow of the surrounding air (wind) increases this rate of cooling (via advection). Greater air flow is caused by normal wind, and is also caused by “relative wind” (movement of the car through the air) when driving. Passive cooling is always a relatively slow and steady process, but is faster when the temperature difference (between pack and air) is higher, and is multiplied further by strong winds, just as common sense would suggest. (The multiplier is roughly +1x for every 20–30 km/h (12–19 mph) of wind speed. So driving at 80 km/h (50 mph) increases the cooling rate by 3x or 4x compared to being stationary with no wind). Low levels of power (10 kW or less), such as overnight AC charging at home, will cause low rates of heat generation in the battery pack, which can often be cancelled out by the above passive cooling process. Medium to high levels of power (above 20 kW) will generate a lot of heat, which may start to overcome the rates of cooling (depending on pack temperature, air temperature, and wind speed), resulting in gradual overall temperature gain over time. 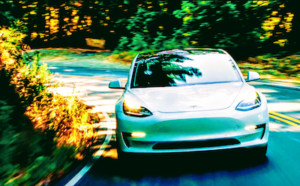 Very high levels of power (e.g., 40+ kW of charging lasting 30+ minutes, sustained high speeds, or bursts of acceleration — or even strong regenerative braking) will cause relatively huge amounts of heat to be generated. This will far outpace the cooling process, resulting in rapid gains in the overall temperature of the battery pack. You can see from the reference charts above that the first 70% recharge (typically from 10% to 80% at 46 kW peak) will likely add around 20° Celsius of battery temperature. This will almost always mean your subsequent charges are throttled (pack temperature above 32 Celsius). You can stop the charge early, after maybe 50% instead of 70%, but still at least 13-15 Celsius will be added. If you are doing a long drive, the best strategy is to drive more slowly from the outset, monitor the heat buildup, and adjust your speed to minimise it, and keep your charges a bit shorter. 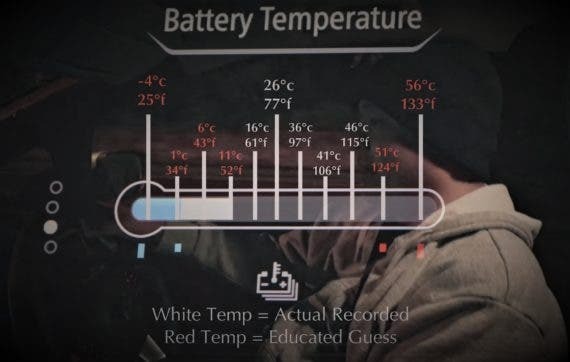 Since the 2018 Leaf’s temperature gauge is currently pretty useless (see another suggestion to Nissan at the end), you will want to get the LeafSpy app to accurately monitor your temperature during a long trip. It monitors many more parameters also. It’s the app equivalent of Scotty on the Starship Enterprise. The graph tells us plenty (click the graph to embiggen). We can see a long journey with several driving stages, punctuated by several DC fast charges (burgundy power line goes negative). Each charge is not charging fully 10–80% but instead 50% or 60% to ~90%. This is to reduce the added heat, as we noted above. Note how cruising speed (~95 km/h, 59 mph) is consistent over most of the journey, and the average power levels are correspondingly consistent. The ambient air temperature is also pretty consistent, mostly between 12° and 18° Celsius, with some slightly warmer patches. 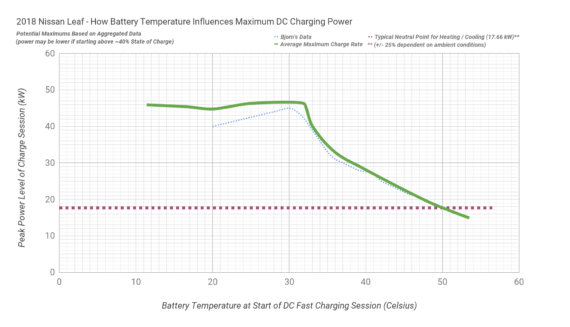 In the initial two driving stages, the battery pack temperature is increasing, whilst in the 3rd stage it is fairly flat, in the 4th slightly falling, and in the final 5th stage more noticeably falling. Since all of the other conditions are consistent, what can explain the different battery pack heating and cooling trends in the different stages? Recall that passive cooling is higher when the temperature difference between pack and ambient air is higher. At the start of a journey, with a relatively cool pack, there is low temperature difference, and thus low rates of cooling. As the pack heats up over the journey, cooling rates improve. It’s almost perversely ironic that the pack has to get well beyond the temperature at which charging power gets reduced before it can approach being able to stabilize its temperature via passive cooling. But that’s the nature of the passive cooling system in the 2018 Leaf. 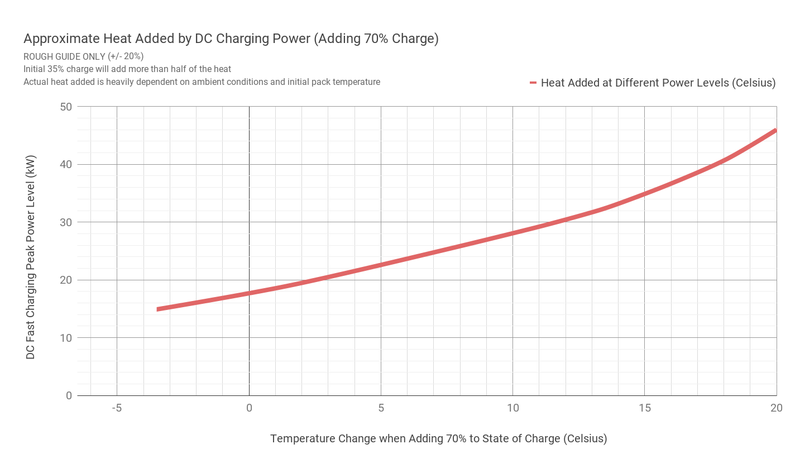 The DC charging power can be seen getting consecutively weaker each time, as the pack heats. The basic pattern to aim for on a long drive with multiple DC fast charges is hinted at by the above graph and discussion. In order to maintain half-decent charging times over long distances, as the battery temperatures climb, you are aiming to shave off (during the slow and steady driving stages) most of the heat that you add during the charging stages. Ideally, you want to keep your plug-in temperature well below 45° Celsius to maintain charges of around an hour or less. The temperature range you can realistically aim to cycle between will depend on your ambient conditions. In the journey profile in the graph, the steady state is starting to emerge by the 4th charging session. The 4th charge starts at around 39–40° Celsius at 28 kW peak power. If this was a fuller 70% refill, it would add roughly 10° Celsius (see reference charts), but since it is a 40% top-up (34% in LeafSpy units), it adds only 6° Celsius. Over the next driving stage, James shaves off most of that added heat. If the charge had started at 41° or 42° Celsius (27 or 26 kW), around 5° Celsius (for a 40% charge) would have been added and the driving stage would have shaved off all of it, back to 41° or 42° Celsius. Plugging in at anything below 43° Celsius (~25 kW or more) will keep a 70% charging session at or under an hour and a 40–50% charging session closer to 40 minutes or less. At 45° Celsius, those figures become 66 minutes and around 45–50 minutes (see the reference charts). Driving slow and steady (in the region of 85–95 km/h or 53–59 mph) should give you a good 90 minutes of driving (128–143 km or 80-89 miles of range) for every 30–40 minutes of charging, even when adding/using only 50% on each charging/driving cycle. Don’t be tempted to drive much faster than this on a journey with multiple fast charges, because it will reduce your range, prevent heat shaving, slow your recharging times, and ultimately cause a much slower trip. Once you have climbed into the low to mid 40s° (inevitable after one or two 70% charges), you want to aim for this steady state. Just moderate your driving speed (and thus power) to try to shave off around 1° Celsius for roughly each 10% state of charge you drive. If your ambient temperatures are 10-15° Celsius or below, bear in mind that cold temperatures cause denser air and need more power for a given speed. Rather than being tempted to drive faster, it’s better to maintain the slower speeds and take the benefit of slightly more powerful, slightly quicker charges. And in very hot conditions (ambient temperatures of 30 to 40° Celsius or more) you will need to either drive slower than 85–95 km/h (53–59 mph) or constantly be running hot and have to accept longer charging times. Despite our intuitions about speed and journey time, because of charge power throttling, driving slower (and cooler) on long drives in the 2018 Leaf will almost always make your overall journey faster. The degree of internal resistance, and thus heating, is strongly influenced by amps (current). 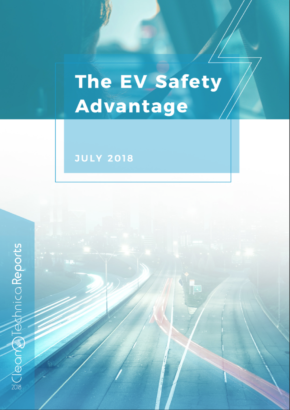 Volts are reducing when a battery is discharging, and when the Leaf’s battery is almost empty, volts are 25% lower and amps (for a given power level) are thus 33% higher, than at full. This is in both power out (driving) and power in (charging) states. So, effectively, if you are cycling power (discharging + charging) the very bottom area of the battery, you are adding 66% more heat compared to when cycling power is at the very top — a good reason, then, to keep your state of charge in a range above 30% or 40% if possible. 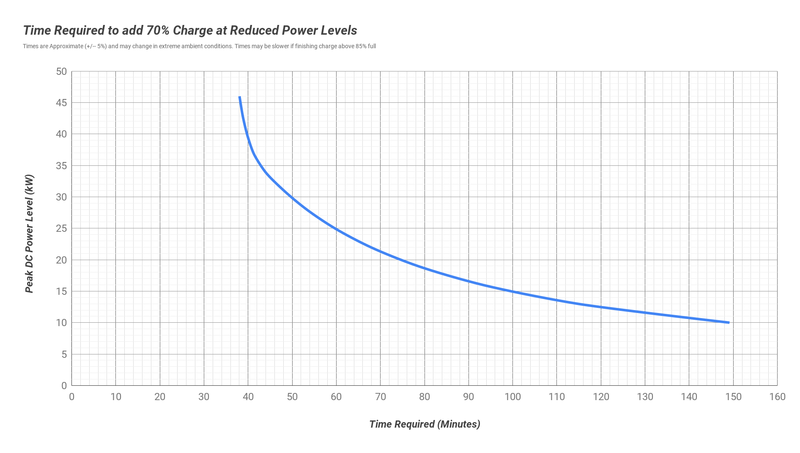 Furthermore, the charging power curve appears to be flatter and less peaky (power peaky = heaty) when you start a charge above 40% (approximately) and are beyond the 32° Celsius threshold. I don’t have sufficient data to say how strong this effect is, but it is present in a few places in the data I’ve analysed. Also, if you default to keeping your state of charge window higher (e.g., between 40% and 90%), it gives you more options (more buffer) for finding the next charger, and more range flexibility on the final driving stage of your journey. That’s useful if you are in areas where DC fast chargers are at low density. In the final driving stage you no longer need to worry about heat buildup throttling another charge, so you can speed up a bit if you like. 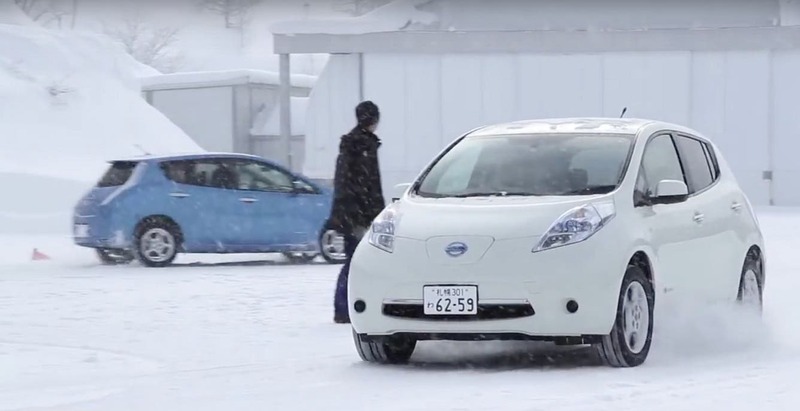 But bear in mind that (in the Leaf) charging to only the level you need to reach your final goal, and still driving slowly, will be at least as effective for overall time as charging longer and driving faster. Think tortoise and hare. For those worried that charging above 80% is slower, it usually is, but not significantly so when you are at reduced charging rates anyway. 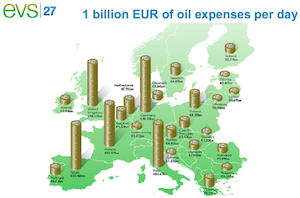 The heat savings are worth it on long journeys for the reasons discussed here. One final pro tip: Drive especially gently and slowly in the final 5 minutes before any charge, as this will aid passive cooling and erase/prevent any potential heat blips, getting you a slightly faster charge than otherwise. Don’t fast charge, or drive hard, on the day before your big trip to avoid adding heat. Use a slower, gentler charger (AC). If you can get to 100% state of charge before nightfall, and let the Leaf cool overnight, do it. If you can feasibly plan your long drive for cooler times of day (dusk to dawn), do it, but don’t risk sleepiness. When charging or parking, find shade and avoid hot asphalt whenever possible. 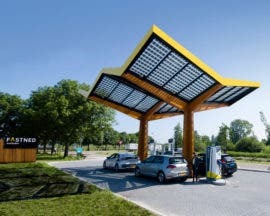 Choose DC charging locations that have shade (e.g., most of Fastned’s locations) over those that don’t. If you can’t find shaded spots, if another car has just left a charger, take their place, since that asphalt has been shaded. Rain and water spray coating the underside of your battery pack are good for cooling, but may sap a bit more power to drive through than dry conditions. Any mode setting that increases regen is undesirable on long drives as it prevents you from coasting, and strong regen also adds heat. Disable B-mode, one-pedal driving, etc. Eco mode helps avoid strong acceleration but also increases regen. Use a smart and gentle right foot instead. Same with cruise control — it’s fine when flow of traffic is free, but if you are in decelerating and accelerating conditions, cruise control may cause strong acceleration (and thus heating). Use low A/C and high fan speed rather than vice versa. Use heated steering wheel and seats over cabin heating. Avoid roof racks, mud/dirt, and anything else that messes with your aero. Use efficient tires and wheel covers/hubs and make sure tires are at safe but high pressure (reduces friction). Ensure your wheels are correctly aligned (reduces friction). 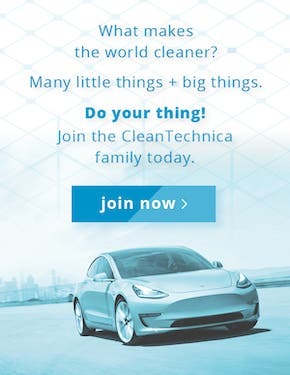 Please support your loyal EV customers, who in many cases bought the 2018 Leaf without being fully aware of the temperature and charging time issues on long journeys. A useful partial solution would be to allow customers to manually set a peak charging rate (below the safe limit) that minimises heat gain and gets predictable results. 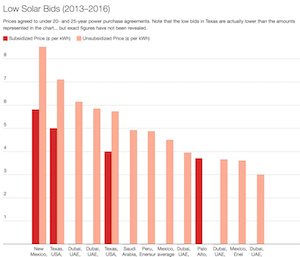 The rate options should be 20 to 35 kW in 2.5 kW increments. Grey out/disable higher powered options as they become unavailable due to overheating risk. Ideally, make the power curves on these options flatter and less peaky (peaky = heaty). This will allow the customer to access more modest but more sustainable charging power and less overall heat gain during a long journey. 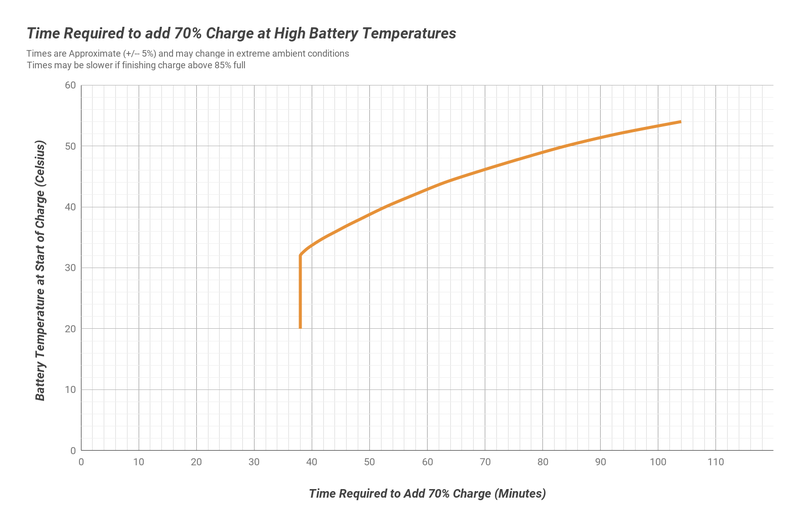 46 kW charging (adding 70%) takes 38–40 mins, but adds 20° Celsius of heat. 28 kW takes 53 mins, but adds half the heat. 23 kW charging takes 64 minutes, but adds just one quarter of the heat. 23 kW (or 22.5) would be ideal for a meal break, for example. These manual options would make a big difference to the user experience on a long journey. Call it advanced charging options and hide it in a sub menu if necessary. Finally, if you could make the temperature gauge more accurate, it would be very useful on long-distance drives. The 5° to 10° Celsius increments of the current gauge design are really not very useful on long trips when trying to monitor and maintain or reduce temperatures when driving. Perhaps put a numerical figure (3 digits, one decimal place) somewhere on the screen. Again, make this an advanced menu option if necessary. Journeys over 290 km (180 miles) in the 2018 Leaf need some strategy to prevent second and subsequent DC fast charges becoming frustratingly slow. Your basic strategy is to drive slowly and steadily, and recharge intelligently, to cycle up and down within a temperature window (likely low to high 40s Celsius) that keeps you within reach of reasonable charging durations. The exact temperature window that works best, as with all the other parameters (driving speed and duration, charging speed and duration), depends on your ambient conditions. Monitor your temperatures and conditions and adapt your strategy to suit. Print out or save the reference charts at the top of this article to help guide you. Thanks again to James and Johannes for sharing their data and expertise. I welcome constructive comments below.